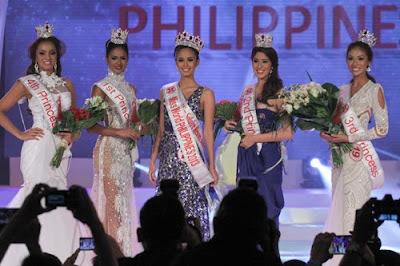 Congratulations Megan Young -- Miss World Philippines 2013! Megan Young (@meganbata) brought home the Miss World Philippines 2013 crown on last Sunday night's coronation night. She will be representing the country in Miss World competition in Indonesia next month. Yey! It's my first time to bet on a candidate as I'm not much of a beauty pageant fan. I'm now a certified Megan Young fan. I've started loving her upon watching her play antagonist to Ritz Azul who stars on TV5 Misibis Bay. Her lovely gown is by Eric delos Santos. I really love it! I hope she'll look just as stunning on Miss World coronation night! Megan Young (@meganbata) -- I don't usually follow news about beauty pageants. No, I'm not much of a fan, except this time around, one of the candidates caught my attention. For me, she's one of the under-appreciated leading ladies of the Kapamilya channel. I've seen her in shows here and there and have not really been much of a fan girl until I watched her on TV5 Misibis Bay. Megan plays Lara Borromeo, one of the antagonists of the main character of TV5 Misibis Bay played by Ritz Azul. I don't even mind that she's playing kontrabida. I've never seen her glow as much as she does these days. Then I learned that Megan finally joined Miss World Philippines 2013. I love watching Megan Young. I think I've become a real fan too. I do believe she has what it takes to make it as Miss World Philippines 2013. I'm rooting for her and I hope and pray that she will take home the crown. I'd love for her to represent the country in Miss World 2013 competition.